Every year, big arctic cod and pollock (sei in Norwegian) from Barents Sea come to the northern part of Norway to lay their eggs. With keen eyes for beauty, they have chosen Lofoten, a chain of islands about 50 miles north of there, as their favorite spawning ground. Many fisherman from here head to Lofoten on their fishing boats in January, fish while living onboard for a couple of months, and make enough money for the rest of the year. The fish are so big that you don’t need to catch too many to reach the boat’s quota every day. The big ones have arrived. Yesterday, we went out fishing off a boat. The equipment is very simple: a gigantic lead lure with a big hook, attached to thick nylon line: cod is a Fish With Small Brain. So dense is the fish underwater that the heavy lure could not reach the bottom. 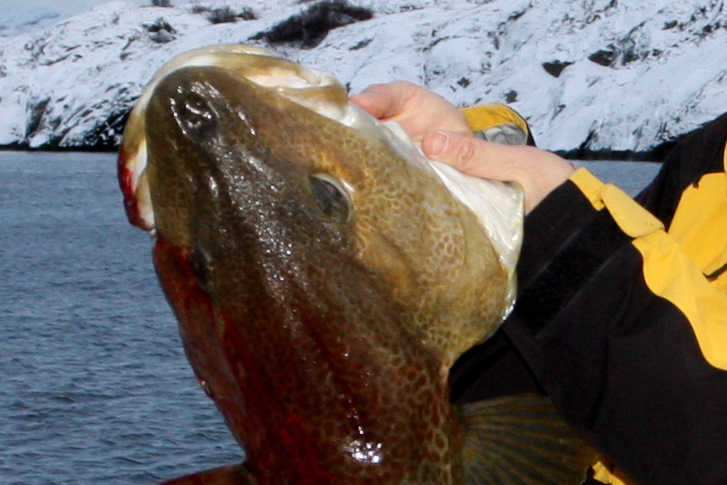 When I dragged up a 19-lb cod (8.7 kg), the hook was in the side of the body. I pulled up this thing by its skin. Big cod don’t fight a lot. It’s a mellow fish that resigns to its fate once it’s hooked. But pollock is different. They’re feisty and exciting to catch. Kristin hooked what must have been a giant pollock and it nearly yanked her off the boat. She lost that one, but caught a few smaller ones. Still, her biggest catch is about 10 lbs. At one point she pulled up a couple of smaller 3-4 lb pollocks that have teeth marks along their entire bodies. We can only imagine the size of the fish that left those marks. When fishing is that good, it is an exercise of restrain. 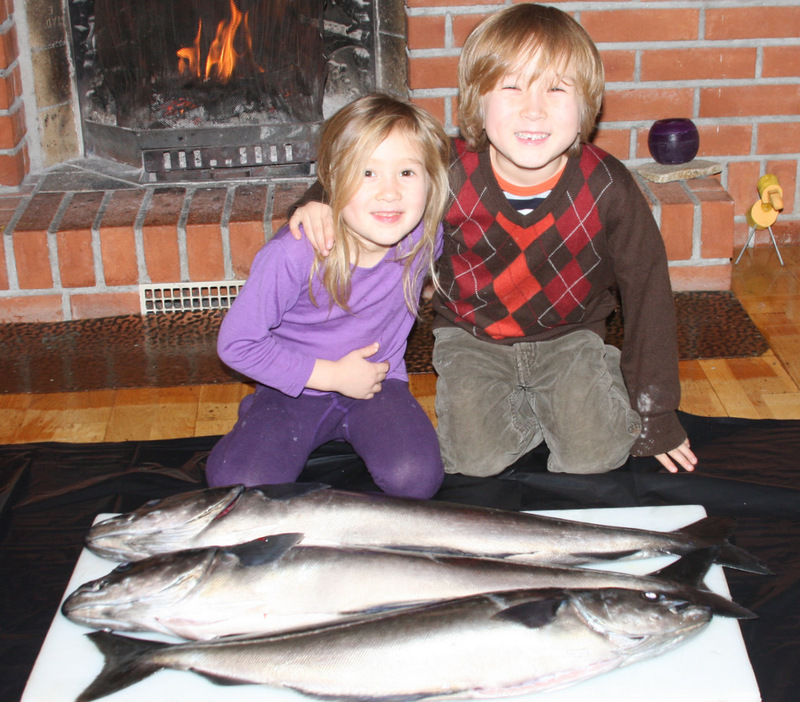 Keeping our greed in check, we still took home about 80 lbs of fish, most of which is sitting in brine now. Next up: cold smoking fish with juniper. are great at embellishing their stories. Maybe its a Norwegian thing. Pulling a 19 lb hooked on the body side must have burned more than my threadmill run today. I wish I were on that boat Winston. Ah, you will need lots of salt in the next couple of months. Thanks Codfather. I feel redeemed. I’ll take an order of 4 fish and chips (cod please) and don’t forget the cole slaw. Thanks. I could send you a big salt cod. You think it’ll pass customs? How cold is it out there this time of year? It’s shockingly warm considering we’re north of the Arctic Circle. Right now, at 1 PM, it’s a couple of degrees above freezing. It’s been like this for a month. Thanks Elin. My wife and I met 11 years ago in Lofoten when I traveled there. It’s a stunning place.